McDonald's: "Billions And Billions Served". They advertise that like it's a good thing. 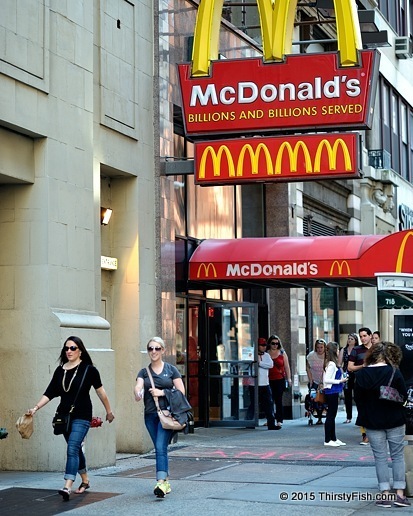 Americans no longer "trust" McDonald's. And sales are falling globally. Is the age of McDonald's over? Science is not immune to bias and influence. A few days ago I wrote about the silly EPA report on fracking. And not surprisingly, internal documents show extensive industry influence over the EPA fracking study. But the best example of scientists engaging in scientism and industry influence has to be the decades long "Butter vs Margarine Debate". Well that debate came to an end today. Science and profits do not mix-and-match. Large corporations in all industries influence science and scientific findings at the expense of people and public health. Take for example these food companies: ConAgra Foods, General Mills, Kraft Foods, Heinz, Campbell's Soup, Coca-Cola, Nestle, Kellogg's, PepsiCo, Hershey's. These giant food corporations that stock most supermarket shelves are using unhealthy additives, artificial flavorings, coloring, dyes, preservatives, GMOs, hormones and toxins, and are constantly lying about the health effects of their ingredients. They are suppressing science and influencing regulatory agencies. In the end, it looks like it's going to be Nature: 1 Billion and counting - Chemists: 0. Synthetic food is not food. Here's a brand new one; Fungus found in Nestle baby food.